Today's mission is to declutter memorabilia and keepsakes from your home, but don't panic when you read this, I don't think you should get rid of all of these things. Instead, in this article I will help you determine for yourself how much room you've got for these types of items in your home, and then how to winnow it down to get rid of the excess so you're only saving the amount you have room for in your home, and that has the most sentimental value. What Are Keepsakes & Memorabilia? A lot of things can be classified as keepsakes and memorabilia, such as small souvenirs or trinkets, and tokens of affection or remembrance. 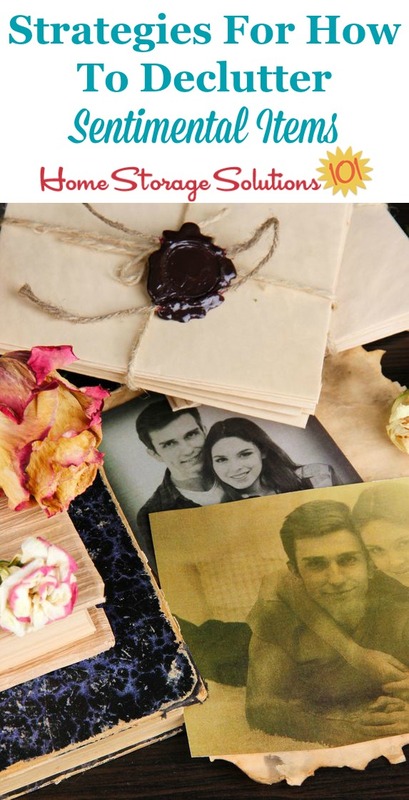 Examples include old letters and postcards, ticket stubs, scrapbooks of newspaper clippings, a lock of baby’s hair, a napkin from a wedding, a dried flower, and much much more. The discussion below will help you declutter any of these types of items, but know that we’ll tackle some of those specific things in other missions, if you’re following along daily. You can wait to deal with photos, or jewelry, or collectibles, or whatever else is on the list later so the whole task of dealing with your keepsakes doesn’t seem as overwhelming. Today, instead focus on items that fit the smaller criteria I mentioned. When focusing on this mission more than dealing with the actual objects and papers themselves you’ll really be wrestling with your own emotions when deciding what to keep and what to get rid of. It can be tough, no doubt, because you kept this stuff for a reason, it meant something to you. is one of them. You can read my article here about letting go of some of the emotions which are keeping you chained to your clutter, so you can break free. Sentimental clutter is, quite literally, the first thing I discuss for a reason. How Much Room Do You Have In Your Home & Heart? The first thing you’ve got to tackle when decluttering keepsakes and memorabilia is deciding how much space you have in both your home and in your heart for these types of items. There is nothing wrong with keeping some of this stuff, and in fact, it’s wonderful to save some of it. I definitely don’t think all keepsakes and memorabilia are clutter. Instead, keeping some is important to help you feel some connections to the past that you want to remember. However, if you’ve got a lot of sentimental clutter, like memorabilia and keepsakes, practically the specialness of each item is diluted because of having too much. You’ve got to have both room in your home for storing these keepsakes, and room in your heart to get them out, somewhat regularly, to enjoy and appreciate them, or you might as well not have them. As I stated in my article linked above, about the emotions that keep you holding onto clutter, this is where actions, in my opinion, speak louder than words. If these items aren’t important enough for you to display proudly, or to be kept in a special place that you can access easily, and relatively frequently (at least once a year) then you need to consider whether it is as sentimental to you as you say it is. Things we love and cherish we take time to store properly, and then to look at periodically and enjoy. If you have too much memorabilia to do that, then some of it is clutter and you should get rid of the stuff that is holding you back from enjoying the truly special stuff. Figuring out how much room you’ve got for these types of items in both your home and heart are very personal questions that only you can know the answer to, ultimately. However, anything that brings up negative emotions instead of something more positive is a much bigger candidate for decluttering. Of course, even things that have more neutral or even positive emotions attached may still need to be decluttered if you just have too much, but if you’re looking for any easy place to begin decluttering it is often best to start with the stuff that is weighing your down emotionally. When it’s time to declutter some of your old keepsakes and memorabilia the first step is to be emotionally prepared. Second, many people (including me) have already somewhat sorted and contained their memorabilia, keeping it in keepsake boxes, like from a wedding, a baby box, or from high school, for example, so just go through one of these boxes or piles of items at a time, because you don’t want to get overwhelmed. You definitely don’t want to spread it all out and then not have time to adequately sort through everything. As always I suggest working 15 minutes at a time, giving yourself permission to stop, if you feel like it, when the time period is up. Make sure though you give yourself adequate time to clean up so you’ve not made a mess when you do stop. Sometimes 15 minutes is all you can take at once when tackling the task, and other times you start to get on a roll. The first item is always the hardest to declutter, and it gets easier after that, so if you have time and are on a roll you may want to consider keeping going while you have momentum, always in 15 minute increments. It is very important, with all decluttering, but especially with these types of items, to go ahead and get them out of your house quickly, by putting them in the trash or recycling bin, or whatever other method of disposal you will use, once you’ve made your decisions, so you don’t second-guess yourself. Limit yourself to a certain amount of space or storage, and then only keep that amount of stuff. Decide, ahead of time, how much space you’ll devote to memorabilia and keepsakes and then stick to it. Typically this strategy works best when you’ve got some type of container to store items in, and you can only keep what will fill up that box or container, and then the rest will have to go. That helps you prioritize and decide what is most important and to give yourself permission to let go of the rest. Display some of the items instead of storing them. Take a photo and discard the bulkier object. Sometimes a keepsake is really big, such as a large piece of your child’s art, for example, and you can remember and smile at the memory just as well from a photo, while taking up a LOT less room. Save one thing representative of the event, person, or memory, instead of all of them. 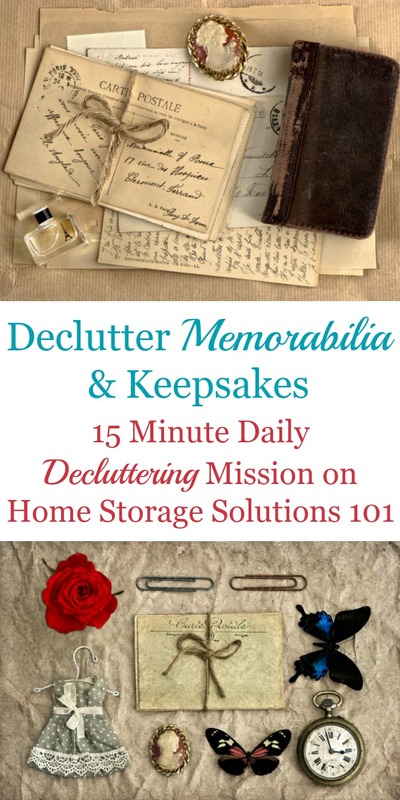 Sometimes you really want to keep something, to help recall a specific memory, but if you can do that through one representative item, while getting rid of the rest of them, this can help you with excess clutter while still allowing you the positives of keeping one keepsake. Pass along items to others who would appreciate them. If you’ve got a whole lot of items, for example, from a deceased loved one, it may be too much for you to have it all in your home, but passing on some of these items to others who also loved that person can help you get rid of excess stuff, while also allowing others to treasure something special to help remember that loved one. Good luck with this mission, it can be a tough one, but can also be a really positive experience for you. Below I’ve got a photo from a reader whose already done this mission, showing her results, to get you motivated to do it for yourself. Scroll down to check it out. 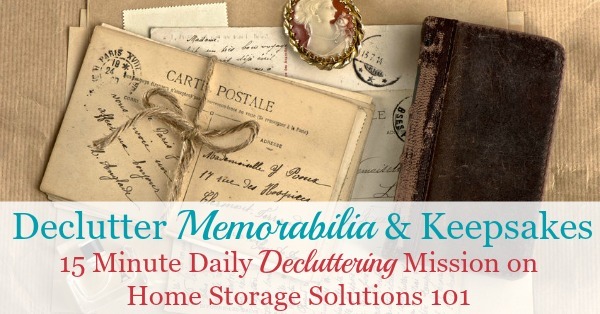 Are You Ready To Declutter Your Keepsakes & Memorabilia? I know it can be tough, but you can do it. To give you a bit of inspiration, here's a photo sent in by a reader, Elisabeth, who has already done this mission. She stated, "I went through my memorabilia the other week and condensed it from two overflowing boxes and a stuffed crate to a partially empty crate for the papers and a box for the trinkets. That felt good!!" You can do it too! And once you do it, make sure to show me what you've accomplished! 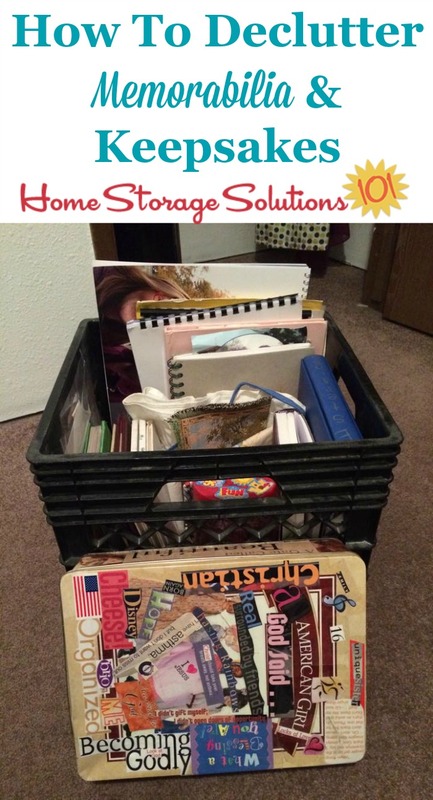 I hope seeing these pictures and these tips have inspired you to get rid of excess keepsakes and souvenirs. 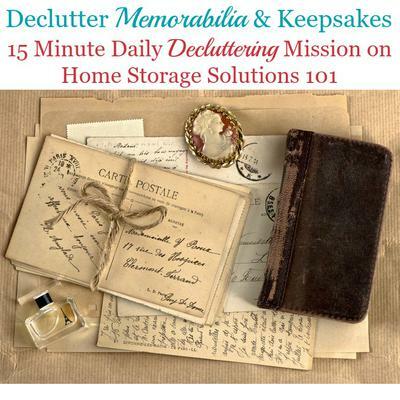 Comments for Are You Ready To Declutter Your Keepsakes & Memorabilia? I've had to start thinking about where family keepsakes will go due to the fact that neither of my children seem interested. I don't think throwing them away is right so I've started thinking outside the box. Would the college that he went to or historical society where they lived be interested? I have a lot of sentimental items and heirlooms. I use and display many of them. I wear my great grandmother's jewelry, especially her engagement ring. Recently I had to get rid of my grandmother's dining set. It broke my heart. Fortunately I was able to save the buffet, but the table and chairs had to go. I used it for 30 years, then we moved and had to combine two houses. We just had no place for it nor did it fit with the decor or use as an everyday table. I do have her kitchen table and use that to wrap Christmas presents every year. I have and use kitchen equipment and dishes from both my grandmothers and great grandmother. I just read the comment about giving a family Bible to a historical society. Yes, please do, you never know how much this could be used and appreciated! In doing family research any and all information is appreciated! Best of luck to you in your organizing and decluttering! My husband and I have adopted a way to declutter keepsakes and memorabilia. It's easier if the item is about to fall apart or something like that. We tell each other what the item meant to us and then we can toss it. It really helps! Excellent post. Thank you. Lots to think about. I have a journaling app that allows you to attach photos. You can also tag entries with any sort of word to categorize entries, such as "memorabilia" or "London." So, if I am decluttering memorabilia, I will take a photo of the item and describe it as fully as I can remember with names, dates and why the particular item is so important to the memory. Then I feel much better when the item is repurposed, given away or discarded. This method is just a variation of the photo logging described in the article, but allows me to add my memories and feelings (while I can still remember them LOL). When I revisit the entry, any photo(s) serves as the visual trigger and the journal entry fills in the details. If I am traveling, I will make a journal entry for each day and add relevant photos. Instant travelogue while everything is fresh on my mind! I have access to the app on my desktop computer, phone and tablet and all sync to the cloud as a safety net. Please consider your local historical society as the recipient for family items you choose to discard.